Last week when I was in Bangkok, I noticed many of the chic local women were wearing a very cute style of shoe similar to plastic jelly shoes–you’ll definitely know what those are if you were a child of the 80s, like me! 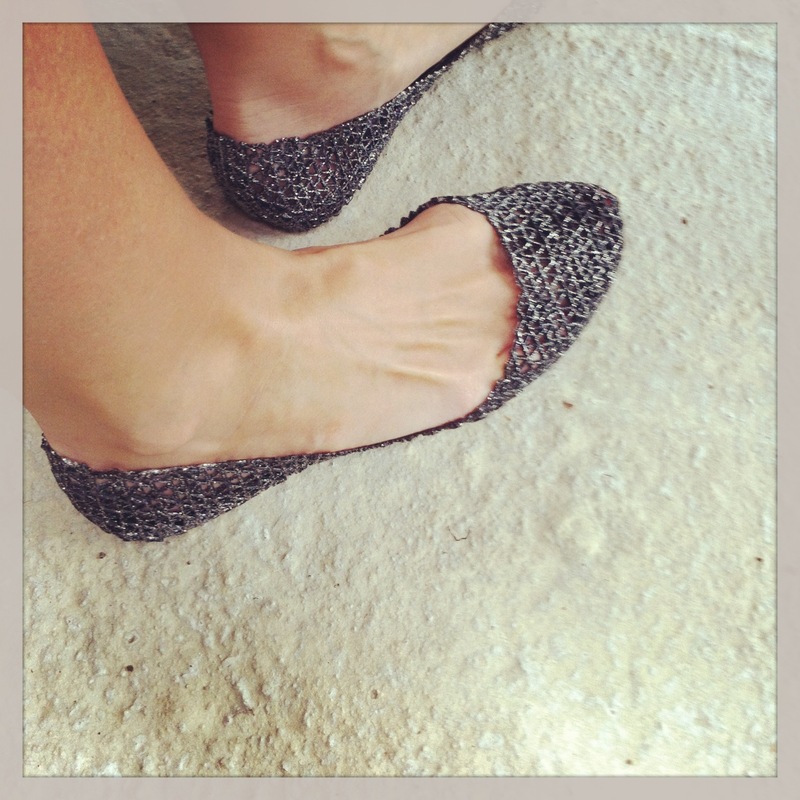 This sparkly, ballet flat style caught my eye and I knew that before I left Bangkok, I must own a pair. But two things stood between me and my new shoes. Finding them, and finding them in my size. Dragging poor Steve around Khao San Road, I popped into every shop where shoes seemed a remote possibility, only to find the ubiquitous flip flops that grace the feet of every tourist in the country. Why were these shoes proving so elusive, yet taunting me from the feet of women walking down the street all around me? We took a break from shoe hunting to visit Wat Arun, the gorgeous “temple of dawn” that sits on the banks of the Chao Phraya river. While taking in the sprawling view from the top, a woman asked me to take her photo. Of course she too had my shoes on, so I asked her where she found them. “Oh they’re everywhere!” she exclaimed. Grr! Our next stop was the massive retail paradise of Chatuchak Weekend Market, a labyrinthine tangle of thousands of stalls selling millions of things–if they don’t sell it there, it probably doesn’t exist. Weaving our way through the crowds, we passed stalls selling cowboy boots, knockoff Chanel bags and tacky souvenirs. Through the hot and crowded melee we wandered, until finally, I spotted it–a shoe stall! A huge selection of jelly flats danced before my eyes, and I happily commenced the try on. Because of my big western feet (size 9 is HUGE in Asia!) only a few of the styles were available in my size, but I came away with this darling silver pair. And priced at a mere $5, my jelly shoes made me the happiest shopper in Bangkok! I absolutely love jelly shoes! Your’s are equally gorgeous! They are adorable, and surprisingly comfortable too! 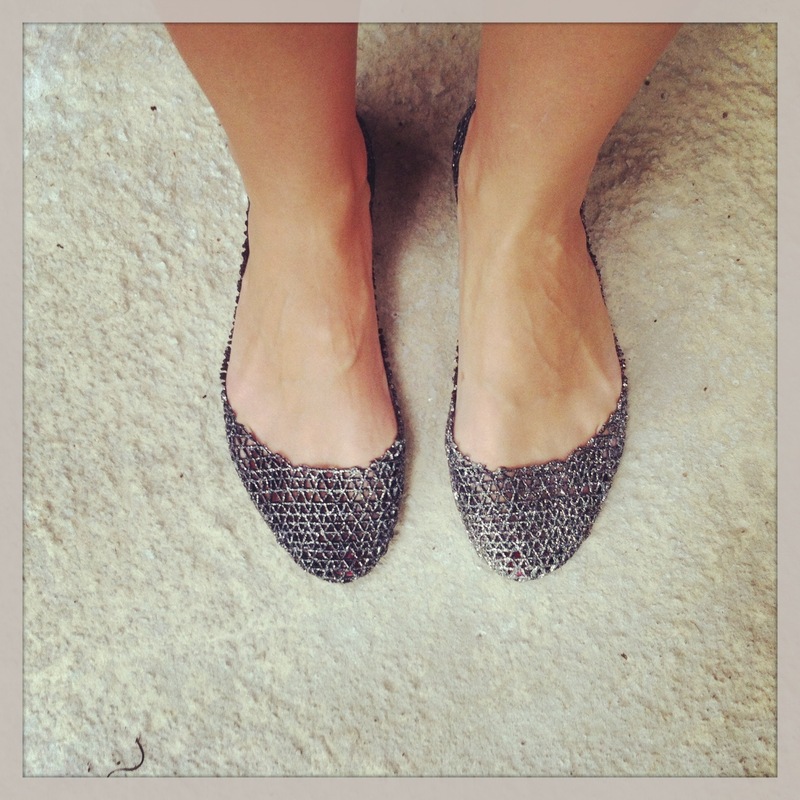 There’s actually a brand called Melissa that I saw online and has a similar style if you want to check them out–the style is the Campana ZigZag Glitter Ballet Flats. And thanks for reading! These flats are quite addicting! Maybe I’ll get a gold pair too next time I’m in Bangkok!